Conceived toward the end of 1939 as a reconnaissance plane, the Saab 18 was characterized by a long completion period. 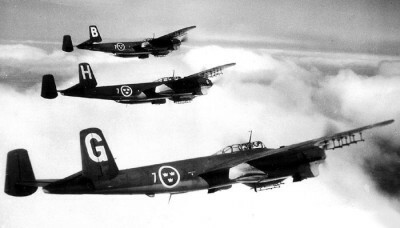 It did not enter into service in the Swedish Flygvapnet as a bomber until the summer of 1944 (it remained until 1956). Production continued well beyond the end of World War II (the assembly lines did not close until 1948) and 242 aircraft were completed in three versions, the last of which (T18B) was built for ground attack. The project (originally designated L-11) originated from a request by the Swedish government, which ordered two prototypes, one in November 1939 and the other in February 1940. However, the course of the conflict led to radical changes in the original specifications. The two experimental aircraft were in fact developed as light daytime bombers and dive bombers. 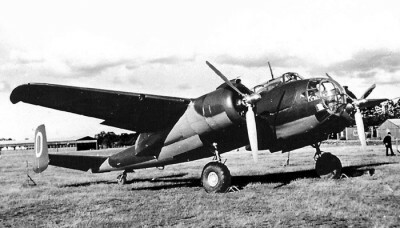 The first prototype did not take to the air until June 19, 1942, and despite the fact that the aircraft appeared to be seriously underpowered, a month later it went into production in two initial versions (on the basis of an order for 60 aircraft): the 818A bomber and the S18A photo reconnaissance plane. The Saab 18 was a middle cantilever wing monoplane with metal airframe and retractable rear tricycle landing gear characterized by an empennage with twin rudders causing it to resemble the German Dornier Do 217 bomber. It was powered by a pair of 1,065 hp (794 kW) Pratt & Whitney R-1830 Twin Wasp radial engines (built on license in Sweden) in wing mounted nacelles. The defensive armament consisted of a 7.9 mm (0.31 in) calibre fixed machine gun in the front and another two 13.2 mm (0.52 in) flexible weapons. The offensive armament consisted of a maximum of 3,311 lbs (1500 kg) of bombs in the hold. The crew was composed of three members, the navigator/gunner, bomb-aimer and the pilot who was housed in a cockpit that was off-centre to the aircraft's longitudinal axis, in order to improve downward visibility. The initial production series aircraft went into service in June 1944, although in the meantime, due to the building on license of the German Daimler-Benz DB 605B engine, Saab had already prepared a second version of the bomber, powered by more powerful engines. On 10 June 1944, the B18B took to the air, showing a marked overall improvement compared to its predecessor. Consequently, production was authorized on the basis of an order for 120 aircraft and the first B18Bs went into service in 1946. In the meantime, the prototype of the final production version, the T18B, developed initially as a torpedo plane, had made its maiden flight on 7 July 1945. In all, 62 of these aircraft were completed in a structure suitable for the role of ground attack. The crew was reduced to two members, while the particularly heavy armament consisted of a pair of 20 mm cannons and a 57 mm Bofors cannon installed in the nose in a pod beneath the fuselage. The first of the B18A bombers began to enter service with the Flygvapen in June 1944 and production of the last T18B ended in 1948, these 242 production aircraft providing valuable service until the last of them was retired in 1956. Powerplant: (Saab 18A) Two 1,065 hp (794 kW) Pratt & Whitney R-1830 Twin Wasp radial engines (built on license in Sweden). (Saab 18B) Two 1,475 hp (1100 kW) Daimler-Benz DB 605B inverted Vee piston engines. Performance: Maximum speed 357 mph (575 km/h) at optimum altitude; service ceiling 32,150 ft (9800 m). Range: 1,616 miles (2600 km) on internal fuel. Weight: Maximum take-off weight of 19,400 lbs (8800 kg). Dimensions: Span 55 ft 9 1/4 in (17.00 m); length 43 ft 5 in (13.23 m); height 14 ft 3 1/4 in (4.35 m); wing area 470.94 sq ft (43.75 sq m). Armament: One fixed forward-firing 7.9 mm (0.31-in) M/22F machine-gun and two 13.2 mm (0.52 in) machine-guns on trainable mounts, plus an internal bombload of 3,307 lbs (1500 kg) and provision to carry air-to-air rockets. (T18B) Two 20 mm cannon and a 57 mm Bofors gun mounted beneath the nose. Variants: 18A, B18A (bomber), S18A (reconnaissance), 18B (a single prototype), B18B (dive-bomber), T18B (attack aircraft). Avionics: Later versions of the Saab S18A did carry radar equipment. History: First flight (18A) June 1942; First flight (18B) 10 June 1944; entered service (B18A) June 1944; production ended (T18B) 1948; retired from service (all versions) 1956.